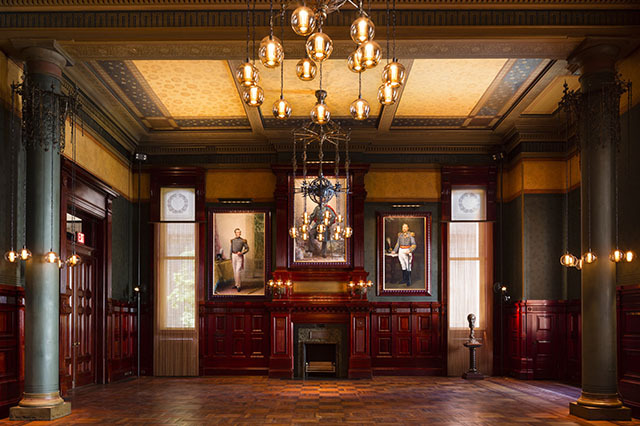 The reception rooms in the Park Avenue Armory were designed by the greatest designers of America’s Gilded Age including Louis Comfort Tiffany, Stanford White and the Herter Brothers. Six historic rooms, ranging size from 500 to 1,650 square feet, are suitable for intimate dinners for 20 to 250 guests or cocktail receptions for up to 800. Historic rooms at the Armory provide an impressive and unique setting for your next event. The Armory’s drill hall is a magnificent space with latticework truss and soaring dimensions, reminiscent of one of the great 19th-century train sheds of Europe. It is one of the City’s largest column-free spaces and has hosted not only drills but music festivals, concerts, benefit dinners, balls, theatrical events, and fashion shows. The use of the drill hall is only limited by your imagination. Rental availability of the drill hall is limited.